The project: A formal dining room in a traditional four-bedroom house in Chanhassen. What worked: Ample space, vaulted ceilings and a private setting on a cul-de-sac. What didn't: Dated paint and wallpaper, too many furnishings and unattractive drapes that block the light. "It's not what you've got, it's how you use it," said Lori Matzke of Centerstagehome.com. Case in point: this formal dining room had too many mismatched furnishings and a chandelier that looked too small for the space. But getting it ready to sell doesn't mean having to refurnish it, Matzke said. "But it does require you to rethink the way you present what you've got to potential buyers for the greatest visual impact." 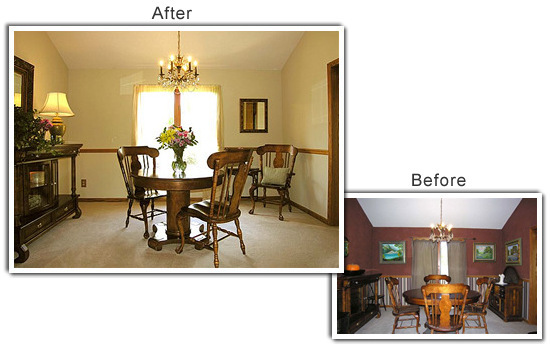 Here's what Matzke did to enhance the appeal of this dated dining room. To give the chandelier a more positive presence, Matzke removed the crystals and cleaned them in warm, soapy water, then rinsed them and let them dry on a soft flat bath towel. She polished the brass and added several strings of clear beaded crystals, purchased online for $20. As a final touch, she made a cord cover for the chain with material that she cut into a 3-inch by 6-foot strip and fastened around the chain with Velcro. Stored excess furnishings including two dining room chairs that took up too much space. Some furniture went into the basement, some was used elsewhere. The goal was to create more room for the buffet. The artwork was part of a collection but attracted too much attention, so Matzke had the owner remove it all and pack it away for the move. Instead of distracting drapes, Matzke softened the windows with sheer panels that allow natural light to shine through. To make the panels "float," she painted the drapery rods the same color as the walls. Matzke chose a soft creamy shade of khaki, complementary to the carpeting, which was professionally cleaned. Choosing a color similar to the color of the carpeting created the illusion of a larger room. Matzke used a collection of large- and medium-size gold-framed mirrors to throw more light around the room and create a reflection of the chandelier for further visual impact. Placement of the large mirror enhances the height of the room, while the medium mirror draws attention to the windows. A $40 hand-painted ceramic table lamp from the clearance shelf in front of the mirror helps brighten the room even more. A colorful floral arrangement is used as a centerpiece. And lush ivy on the buffet softens the heavier elements. Large accessories in the cabinet add color.